Are you in the market for a new Toyota car, truck, or SUV? 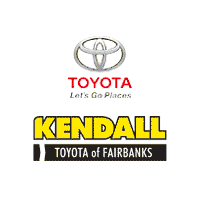 With the help of the staff here at Kendall Toyota of Fairbanks, we can work with you to help you find a Toyota that suits all your needs and desires in a new truck, new car, or a new Toyota SUV. We have an expansive selection of new Toyota cars available to our customers. Check out popular vehicles such as the new Toyota RAV4, Toyota 4Runner, Toyota Highlander, and many others. Learn more about these vehicles and all other Toyota services we offer at Toyota of Fairbanks by getting in touch with our sales team! Contact us online to see how we can help you get behind the wheel of the perfect Toyota for you. We look forward to hearing from you and helping you during your next visit to our Fairbanks Toyota dealership, also serving the areas of Fort Wainwright and North Pole! Find the car or truck of your dreams when you come look at our new inventory of Toyota cars in Fairbanks, Alaska. While you’re here, take the time to explore our like-new Certified Pre-Owned Toyota cars. We also carry a wide variety of convertibles, sports cars, and luxury cars in Fairbanks, Alaska. With a variety of customization options for your new Toyota, the staff at Kendall Toyota of Fairbanks is convinced that we can find a new car that suits all your needs in the Fairbanks area. You can browse our current in-stock inventory of new Toyota cars above or browse our online showroom to view our entire Toyota lineup. Are you looking to get a little more out of your new Toyota car? Then don’t go with a car and buy a new Toyota truck instead. 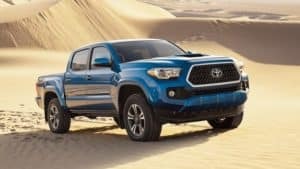 As your Fairbanks Toyota dealers, we carry a large inventory of new Toyota trucks for sale and our staff can help you find the perfect truck for your budget and lifestyle. With the wide array of available TRD packages, Toyota trucks are equipped to get you where you want to be no matter which road you take, or don’t take. The beefy Toyota Tundra is built to get you and your toys wherever you’re headed with ease and in style. You can bob and weave through off-road trails and look good at the same time with the bold Toyota Tacoma. Shop our selection of Toyota trucks in Fairbanks, we’re sure you’ll find what you’re looking for.